Long Pond connects to Hither Creek and Madaket Harbor by a ditch dug in 1665 through a cooperative agreement between the island’s early European settlers and the Wampanoag Indians also living on the island who sought an efficient method of harvesting Blueback herring and American eels spawning and living in the pond, respectively. Sadly, though, tidal exchange between Madaket Harbor and Long Pond via the ditch through salt marsh isn’t robust enough to keep up with the amount nutrients entering this pond from nearby houses, all of which have septic systems, and from the Nantucket Landfill, which sits right on the eastern edge of Long Pond. This southern portion of Long Pond has several coves and then drops down to within 200 feet of the ocean before hooking back northward to form White Goose Cove, making it impossible for total twice-daily tidal flushing. As it is, it takes 76 days for this pond to turnover completely. Long Pond, which early Nantucketers and their Native American neighbors had opened early on, hasn’t been opened in at least two centuries, but it remains brackish because of the Madaket Ditch. 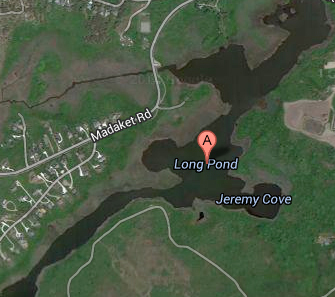 Access to this pond is via First and Second bridges along Madaket Road and the beach at the end of Starbuck Road.